So the other day Vanity Trove sent me their December box of goodies! Inspired by the Japanese fukuburuko, every month you will receive a box of beauty products for you to try out. It works like a grab-bag: you never know what you'll get, but each box is carefully packaged by the staff to provide you with a "beautiful surprise"! This was my box! It arrived in a SmartPac box so you don't have to worry about it getting damaged! The Vanity Trove box itself is also extremely sturdy. The box works like a pull-out shelf, and on the left is a quick glance at some of the items inside that were nestled on "bedding". And here are the items in it! Close-up! Coffee beans and face masks not featured here. 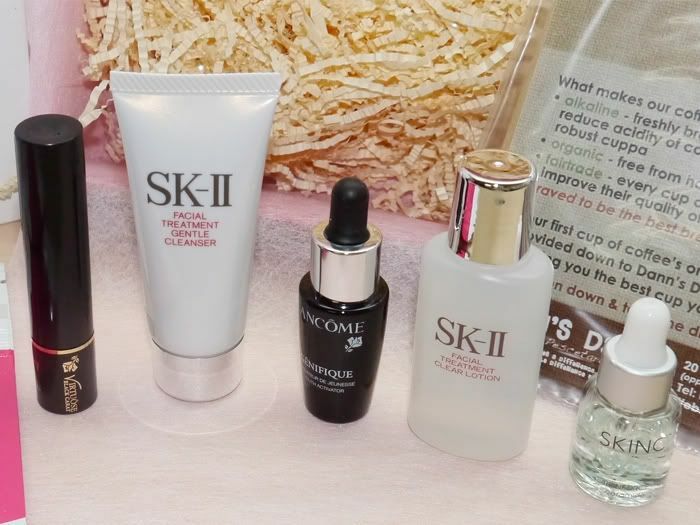 I was especially keen to try the SK-II products because I always see their advertisements on TV ("SK-II Pitera! Skin so soft & smooth!" *astonishingly pale Asian celeb slides hand across face*) but their products are pretty expensive! That's the good thing about the Vanity Trove concept - you get to try out lots of different products that you normally wouldn't have access to! January's box for example, contains a Clinique moisturizer as one of the products. 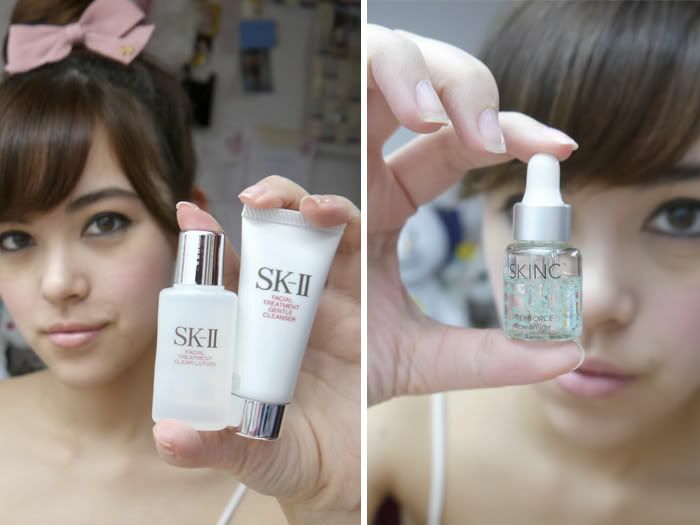 I featured the SkinC serum on the right mostly because the small blue things in it look really cool LOL. Here's how it works basically: for $25/month (or $300 for 13 months), you'll get each month's Vanity Trove delivered to your doorstep with different products each time for you to try out! They also have gift options of 1, 3, 6 and 12 month subscriptions for you to purchase on behalf of someone else too. 6 comments on "Vanity Trove"
similar to glossy box/birchbox. very nice! :D i love the packaging too! SK-II is very very awesome!